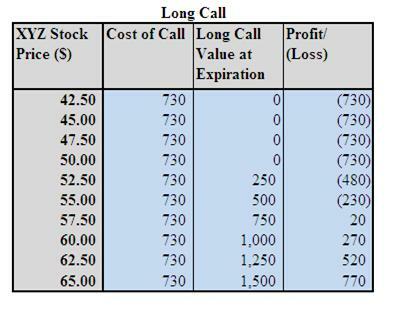 A Long Call strategy involves the purchase of call options. Outlook: With this stock option trading strategy, your outlook is bullish. You are expecting a rise in the underlying stock price and/or volatility. Potentially unlimited to the upside of the underlying stock. This is a net debit trade because you pay for the call option. Unlimited profit potential with limited risk. Greater leverage than simply owning the stock. Requiring lesser capital than buying the stock outright. Potentially 100% loss on amount invested if the strike price, expiration dates or underlying stock are badly chosen. Sell the call options and close off the position at a profit. Sell the in the money call and use the proceed to purchase a out of the money call. Create a spread by selling an out of the money call against the current long call position. Exercise the call to own the stock. Let it expire worthless (not recommended). 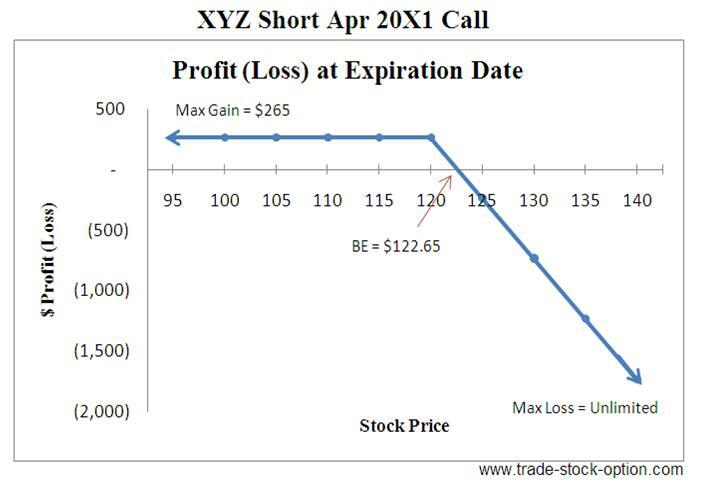 Assumption: XYZ is trading at $55.83 a share on Mar 20X1. You are expecting share price of XYZ to rise. 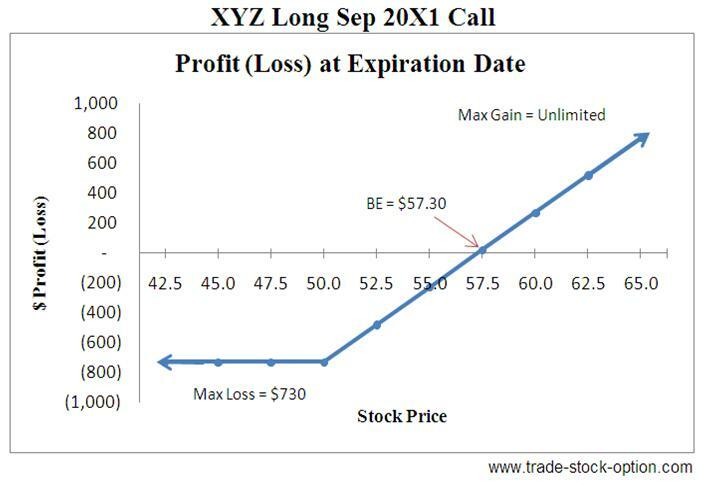 You may buy one Sep 20X1 $50 strike call at $7.30. Note: commissions are NOT taken into account in the calculation. Maximum Reward = Potentially unlimited to the upside of XYZ. Buying (Long) a call is perhaps the most basic of all option trading strategies and the easiest for a beginner to learn. This is because most of them are familiar with buying asset and profit from its increase in value. A Long Call usually increases in value due to the rise in the underlying stock price or increase in volatility. It decreases in value due to time decay, drop in underlying stock price or contraction in volatility. Try to ensure that the underlying stock is in a upward trend when you are using this strategy and identify a clear area of support. Option is a wasting asset and time decay work against you in this strategy. To get better trades than buying the stock itself, do ensure that you give yourself enough time to be right. Generally this means that you should only buy call that expire in more than 3 months. An alternative method for buying a shorter term option is to buy only deep ITM options. Buying deep ITM option is more expensive but the attraction is that it is straight forward and almost can have point for point price movement of the underlying stock. Buying OTM option is cheaper and offers you higher leverage but it is also a low-probability strategy. You should pick the strike price and time frame of the call options according to your risk profile and forecast. Selecting the best strike price at the appropriate time frame is a balancing act between paying as little as possible while trying to gain the highest possible profit potential. Next go to another bullish strategy, Short Put, to learn how profit can be make from a bullish stock.